The grouchy man in a lab coat looked away from the scanner he was holding and scowled down at her. "What's she doing here?" he demanded in a grouchy voice. Grandmother squeezed her hand. "Gerald, this is Trancy. She came with me to see the angels today." The grouchy man curled up his nose like she smelled weird, but she'd taken her shower. He scolded her grandmother. "This facility is open twenty-five hours a day, thirty days a month--except for two hours every nine days." "Which is when the biggest groups of angels gather," Grandmother replied. "This is when they're their most interesting." "She can watch them on the vids like everyone else." Trancy smiled. She knew that tone. No one said "no" when Grandma used that tone. And neither did Mr. Grouchy. "She'd better not." He sniffed in her direction, then turned away. She decided she didn't like him. Nonetheless, she did her very best to stay quietly at Grandmother's side while she helped the other researchers set up. 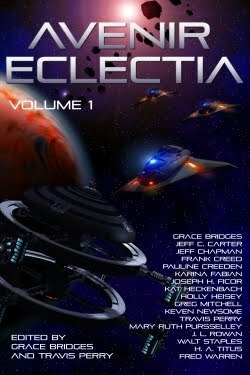 Now and then, Grandma explained what they were doing, and how elusive the inhabitants of Eclectia's waters had been. "Elusive?" Trancy rolled the word on her tongue. "We don’t see them much," Grandmother defined. "Except for times like these!" one man said cheerfully and bent down to point at one end of the window. She watched the Angels, mesmerized, as the researchers started their observations. "Looks like a school of thirty--a little bigger than lately, but not unusually so. Juveniles and adults." "I still think we're on the path to some kind of maturation grounds." "Then why do they stop? Every time?" "We've not done anything to the Angels. No, we're just a curiosity--there! Look! The adult directs their attention to us." "Which holds to my theory that they are training them to recognize us as a threat. See that one, racing from one end of the window to another? Obviously a territorial behavior. Five to one, one of them will press their mouth to the tank in some kind of display! In ten…nine…"
A moment later, credit chips passed hands. The same thing happened again as someone predicted that one would lash its tail against the tank. But something else caught Trancy's eye. "Grandma, we've seen that one before!" She pointed to one angel, whose fins had delicate yellow piping, lingering a ways from the rest. Grandmother followed her gaze. "Why, I think we have--but not in a school." Mr. Grouchy growled. "You just want to kill my migration theory! Well, we've got it recorded; we'll check. They're moving on to Crendal's group now. The entire group gasped as the yellow-striped Angel waved back. I like seeing the other side of the story, from the other side of the glass. Very good. The stuff that good spec fiction is made of.